"Four decades ago, it was accepted that the meniscus didn't play a significant role in the knee joint. 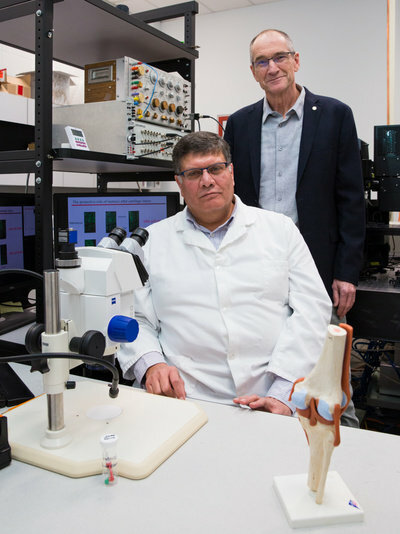 When someone damaged their meniscus, surgeons usually removed all or part of it—as they did with Bobby Orr," says Dr. Ziad Abusara, Ph.D., Faculty of Kinesiology, who won an award from the Orthopaedic Research Society in 2017 for his study findings. "Only later, it was discovered that most patients who had their meniscus removed developed knee osteoarthritis." "It was surprising how quickly the cells died when the meniscus was removed. Half of the cells which make and maintain the components of the knee cartilage were dead within four hours," says Abusara, noting it was the first time using this very powerful microscope to do this type of research. "When the cells die, it puts the knee at a high risk of degenerating and developing osteoarthritis." Arthritic diseases are a leading cause of disability worldwide. Osteoarthritis is associated with increased rates of obesity, heart disease and mortality, likely because those who have it are less mobile. It's estimated that osteoarthritis will cost Canadians $550 billion in health-care expenses by 2040. "This means trying to keep the meniscus in place when developing early treatment interventions," says Abusara. "This will help to prevent cells from dying and help to maintain the health of the knee joint." "Not everyone who has their meniscus removed develops knee osteoarthritis," says Abusara. "Now we want to understand why some people develop it and some don't, so we can find solutions for this costly and debilitating disease."